Over and over I hear people say that nearly all foods are genetically modified. I’ve heard this from people that are involved in the agriculture industry, people that aren’t, and some people that even plant GMO crops on their farm. I’ve heard this statement so much, that I’m labeling it as the Number One Myth about GMO Crops. Last week I came across a meme going around Facebook that said, “I think when some people talk about genetically modified foods, they aren’t thinking about where seedless watermelon come from.” The thing is, seedless watermelons aren’t genetically modified. Seedless watermelon are grown on triploid plants, making it unlikely they will produce seed. Most of the foods we eat today have been modified from their original form, while very few are actually defined as GMO. 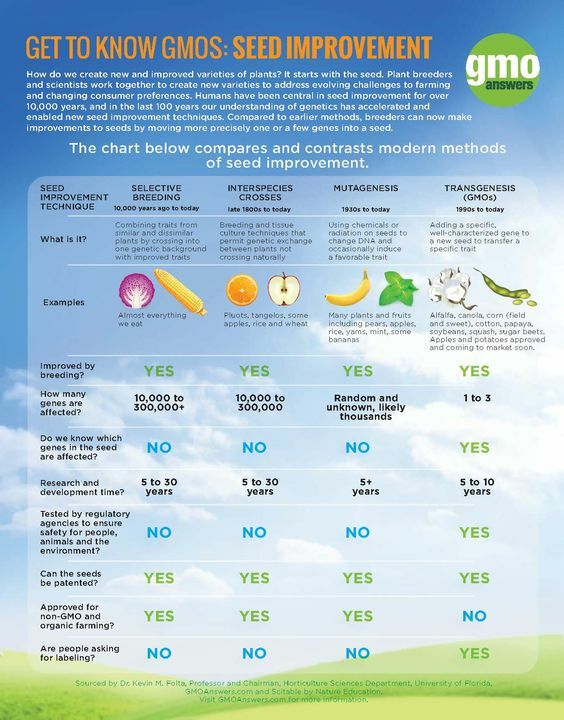 Farmers have been modifying plants through crossbreeding for thousands of years to get the most desirable traits. This process can be lengthy and produce varying results. Modern genetic modification allows scientists to select a naturally occurring gene and insert it into the plant genome. This process is much more precise and keeps existing traits the same, which is not always possible in crossbreeding. So those looking perfect looking tomatoes, extra large strawberries, and seedless grapes must be GMO, right? The fact is that only 9 GMO crops are commercially available. Each of these crops has been put through more than a decade of testing, and is approved by the FDA, EPA, and USDA before they ever reach your grocery store. * One more, the Arctic Apple, is approved and coming to market soon. It’s unique trait: the flesh doesn’t brown! Each of these varieties was created for a specific purpose. At our farm, we do grow GMO corn that is fed to our cattle. Over the years we have not seen adverse effects in our cattle, but we have seen the positive effects of higher yields and less pesticide use. Overwhelmingly scientists agree, 88% say that GMOs are safe2. If you still have questions, that’s ok! I would never suggest that you should take me at only my word. Do what I did, do some research, talk to farmers, and read the opinions of scientists about GMOs. The only thing you shouldn’t do… believe everything you read on Facebook.